The Museum is housed in the restored three story bank barn that was built into the hillside to make both floors accessible from ground level. Livestock were kept on the lower level, crops above. In bad weather, the farmer could feed without going outdoors. Today, some of the exhibits arranged in the barn cover the tools and equipment used by the farmer to raise and harvest the crops that provided fodder for livestock and commodities to sell. Other displays cover the domestic chores of the farmer's wife in the preparation and preservation of food and the making of clothing. Early examples of now common implements and appliances give the visitor a sense of passing time. The Museum property was once part of John Holcombe's "Plantation", according to his will of 1742. 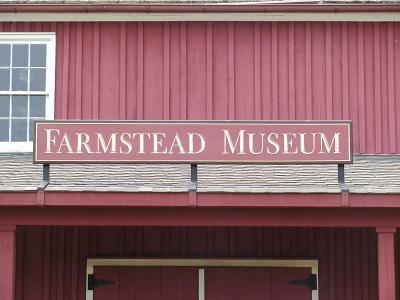 In 1968, the Farmstead was donated to the Hunterdon County Historical Society by Milo and Rachel Jimison who retained life rights. With Milo Jimison's death, over 250 years of agricultural activity on the site ended. In 1984, the property was deeded to the Holcombe-Jimison Farmstead, Inc. Using a combination of grants from small foundations, individual donations and a substantial gift from Colonel James Horn, the Museum's volunteers and Trustees have restored the property and added outbuildings for the Post Office, Blacksmith Shop, Carriage Shed, and Print Shop.